The downtown area of Yangon is walkable, and it is the best way to take in the sights. But to get to certain places, including the Shwedagon Pagoda and Inya Lake, as well as some museums, restaurants and bars, you may need to take a taxi. Taxis are the most popular – and generally easiest – way for foreigners to get around Yangon. No matter what time of day, they are easy to track down and generally cheap, although you should beware the traffic, which can get very heavy (particularly around evening rush hour). Taxis cost from K1,500 for short journeys in the downtown area to K3000 for longer trips within the city (up to K8,000 for the airport). The Grab ride-hailing app works in Yangon, as well as some local alternatives; if you use these apps, note that it does not necessarily mean that drivers will understand maps well (meaning occasional issues with pick up and drop off locations), and payment may still be with cash. Most – though not all – Yangon taxi drivers speak some English. To find out more, go to getting around Myanmar by taxi and car. 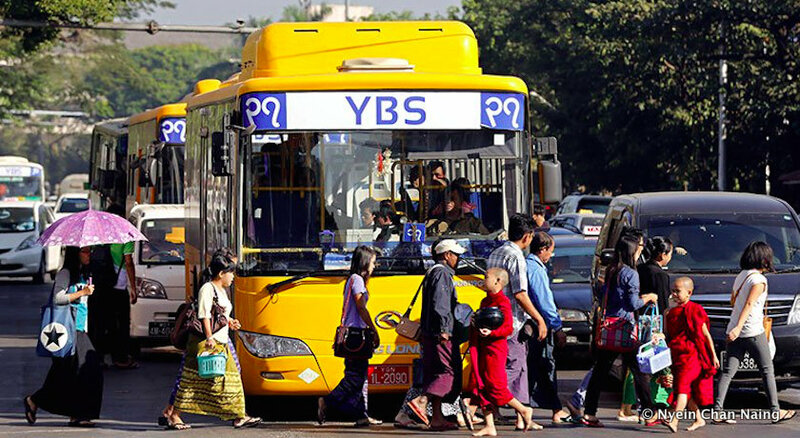 Making sense of Yangon’s bus system is a real challenge for visitors, due to the large size of the city and the hectic nature of bus travel. There are now an increasing number of air conditioned buses with route numbers in western script, but some buses remain in poor condition and the use of Myanmar script is still widespread in places - making it difficult to work out routes. Buses are also slow, but they are cheap (usually K200-K300) – if you want to give it a go, the best thing to do is ask a local. Aung Mingalar Bus Terminal (sometimes known as Highway Bus Station) is Yangon's primary bus station for interstate bus travel. From downtown, taxi fare is around K8000 and can take up to an hour and a half, depending on traffic. A taxi here from Yangon International Airport costs approximately K3000 and takes around 30 minutes. If heading to Ngwe Saung, Ngapali Beach or another westward destination, you must depart from Hlaing Thar Yar Bus Station. For more information on travelling between Yangon and other destinations around Myanmar, click here. For many years, motorbikes have been banned in Yangon, although you will see the occasional policeman – or person with the right government connections – riding one. Bicycles are also technically not allowed in some areas, but as a foreigner a blind eye is usually turned by the authorities. Small bicycle rental shops are popping up around Yangon and can be found in a handful of downtown hostels. To arrange a bicycle tour, send an email to [email protected]. Trishaws (cycle rickshaws) are another way to cover shorter distances in the downtown area, although foreigners tend to get ripped off, and you will rarely be able to get one for less than the price of a taxi. Just to the north of the downtown grid is Yangon Central railway station, which is the start and end point for the Yangon circular railway. This slow-moving, 46-kilometre commuter loop isn’t a practical way to get around for visitors, but it serves as a fascinating slice of local life. Tickets cost $1. See downtown and the riverfront section for more details.